WASHINGTON (CNS) — In recent months a number of states have put in place new laws either to expand or restrict abortion. Now a new measure in Mississippi makes that state among the most ardent to ban early-term abortions. On March 21 Mississippi Gov. 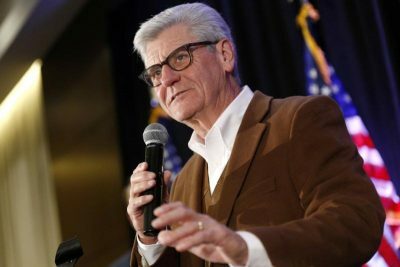 Phil Bryant, a Republican, signed into law a “heartbeat bill” that will prohibit abortions in the state after the time of gestation in which a fetal heartbeat is detected. It was approved by a 34-15 party-line vote with most Republicans supporting it and most Democrats rejecting it. The House passed it in a 78-37 vote. Set to take effect in July of this year, it will set tough restrictions for the state’s only abortion clinic — Jackson Women’s Health Organization. Groups that support legal abortion already have plans to challenge the new law. According to The Washington Post, the Center for Reproductive Rights, the American Civil Liberties Union and NARAL Pro-Choice America have all labeled it unconstitutional and plan to wage a court battle against it soon. A legal fight may indeed prove problematic for the bill. According to The Hill, a similar measure was approved by Kentucky’s legislators and signed by the governor March 15, only to be stopped by an order from a federal judge the same day. The legislation is on hold until a hearing on it can be held. Leading the effort against the Kentucky version was the ACLU, which teamed up with the state’s only abortion clinic. Other states in which heartbeat bills have gained traction include Georgia and Ohio. Iowa also had passed such a measure, but in January, a judge declared it unconstitutional. Other states, like Rhode Island, continue to seek policies that will expand abortion access. Such expansion became law in New York but failed in New Mexico and stalled in Virginia.